Can't Be Topped: Neapolitan-Style Pizza Making Wins UNESCO Heritage Status : The Two-Way The traditional form of pizza making was recognized on Wednesday by the U.N.'s cultural arm. The designation is intended to safeguard and raise awareness about forms of cultural heritage. 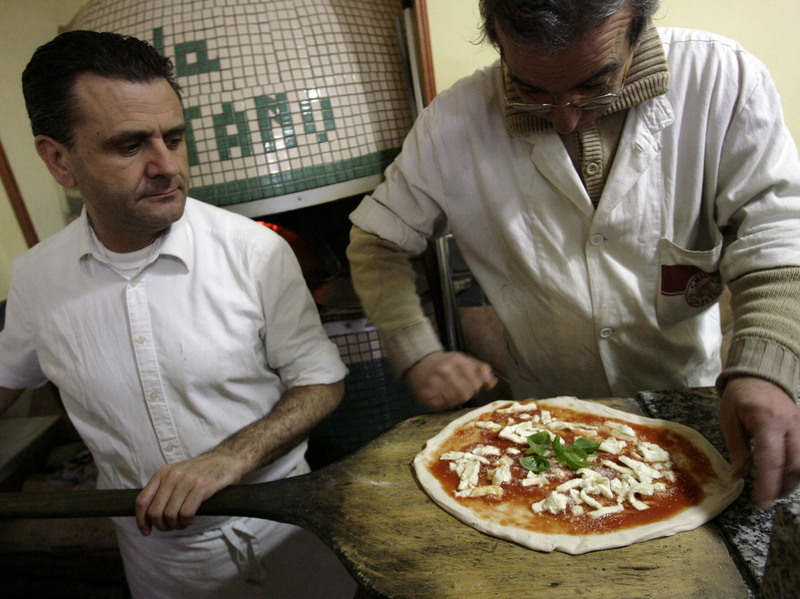 A pizza is prepared at a restaurant in downtown Naples. On Wednesday, the traditional art of pizza-making was given UNESCO cultural heritage status. When a UNESCO World Heritage Site comes to mind, perhaps it has the natural splendor of the Great Barrier Reef or the imposing mastery of the Pyramids of Giza. Now one may look no further than the humble pizza for world heritage status. No, not the frozen kind, the old-school kind baked in a wood-fired oven. On Wednesday Pizzaiuolo, the art of Neopolitan pizza-making, was added to UNESCO's Representative List of the Intangible Cultural Heritage of Humanity. UNESCO says the designation is meant to safeguard and raise awareness about forms of cultural heritage — often passed down from generation to generation — before they die out. Around three dozen other cultural practices were also added to this year's intangible list, including Kumbh Mela— an event in India when pilgrims bathe in a sacred river and Uilleann piping— a type of Irish music played by a particular bagpipe. As for pizzaiuolo, it is more than a slice of sustenance, it is a form of artistry with a deep history baked right in. Pizzaiulo "fosters social gatherings and intergenerational exchange" and the "Pizzaiuoli (pizza-makers) are a living link for the communities concerned," says UNESCO (the United Nations Educational, Scientific and Cultural Organization). The practice of pizzaiuolo consists of a few stages: first the dough (water, flour, salt and yeast) must be kneaded by fist for at least 15 minutes, then allowed to rest and rise for 12 hours. Next balls or panetti are formed and left to rest some more. Then the dough is stretched and beaten into a circle. Finally the toppings are added, and the pizza is placed in the oven and rotated with a pizza shovel to ensure uniform baking. Two minutes is all it takes. The Naples-based Associazione Verace Pizza Napoletana (True Neapolitan Pizza) will only issue its trademark to restaurants that follow even more stringent guidelines. But the result should be a pizza for the senses with "the flavor of well-baked bread. The slightly acidic flavor of the densely enriched tomatoes, mixed with the characteristic aroma of the oregano, garlic or basil ensures that the pizza, as it comes out from the oven, delivers its characteristic aroma." Pepperoni and pineapple lovers are out of luck. The association says only two kinds of pie are authentic: marinara pizza with tomato, oil, oregano and garlic and margarita pizza with the addition of cheese and basil. Pizzaiuoli can take it to the next level by stretching and tossing the pie in a doughy display of acrobatics at international competitions. When news of the UNESCO recognition broke in Naples, pizza-makers handed out free slices on the street to celebrate, according to the BBC. Two million people had reportedly signed a petition supporting the piazzaiulo application. "After 250 years of waiting, pizza is humanity's heritage, its intangible heritage," Neopolitan pizza maker Enzo Coccia told the BBC.